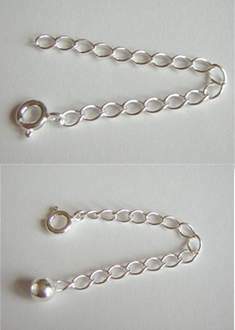 Lengthen conventional closure necklace styles with extension chains. Each extension adds up to 2" (5.08 cm) to designs. Tear drop and ball accents add a professional looking finishing touch. Spring ring and lobster clasp extension chains cab be attached to finished necklace clasp to lengthen. For a designer look, use the extension chain with lobster clasp. Gold Plated only, available in 7 or 144 pc packs.